An uncommon sight in Britain and Ireland, but also found occasionally throughout most of northern and central mainland Europe, these large dapperlings are also reported from parts of western North America. 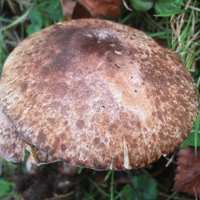 This chunky woodland mushroom was described in 1854 by British mycologists Miles Joseph Berkeley and Christopher Edmund Broome, who gave it the scientific name Agaricus badhamii. 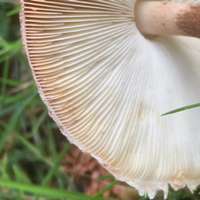 (Most gilled fungi were placed in the Agaricus genus in the early days of fungal taxonomy, but the majority have since been relocated to new genera.) In 1943 French mycologist Marcel Locquin (1922 - 2009) transferred this species to the genus Leucocoprinus, thereby establishing its widely accepted scientific name Leucocoprinus badhamii. Leucocoprinus is derived from the Greek Leucos meaning white, and coprinus the genus name of inkcaps such as Coprinus comatus that are close relatives of the Field Mushroom. So Leucocoprinus suggests a group of white-gilled mushrooms that are in many respects similar to Agaricus species. The specific epithet badhamii honours British physician, mycologist and writer Dr Charles David Badham (1805-1857), author of Treatise on the esculent funguses of England, which was published in 1847. 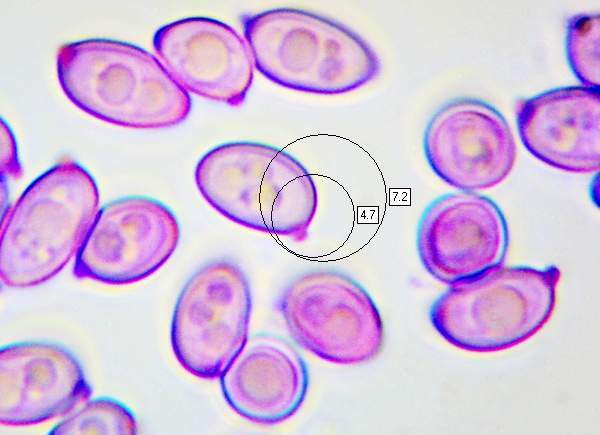 Initially ovoid, becoming broadly convex; whitish background with dark brown to black adpressed scales; surface turning blood red when cut or bruised..
Cap diameter at maturity ranges from 2 to 12cm. The free, crowded gills are white at first, eventually becoming pale flesh-pink and bruising red. Cheilocystidia 7-20 x 5-7 μm, irregularly clavate with constricted apices. 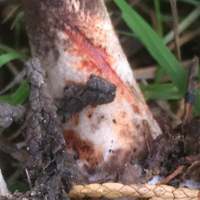 3 to 10cm long 3 to 6mm in diameter, with a thin white ascending stem ring and a clavate base; turning blood red when cut or bruised. 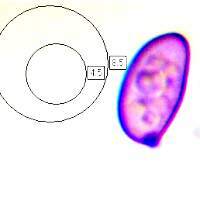 Amygdaloid (almond shaped), smooth, 5.5-7.5 x 3-4.5µm, with a distinct germ pore; dextrinoid. Saprobic, usually in small groups in deciduous and mixed woodlands. Lepiota bruneoincarnata s similar but does not turn blood red when bruised. 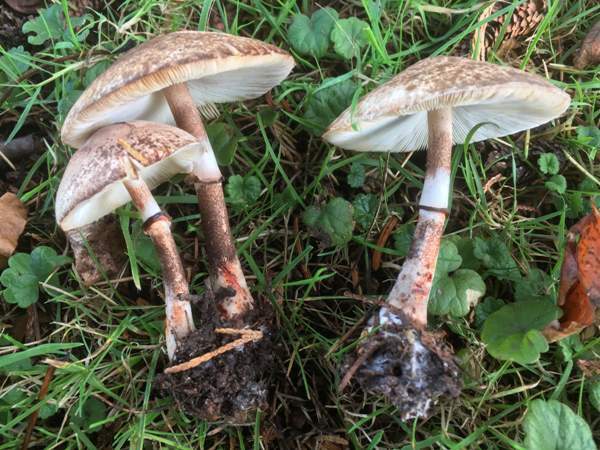 Leucoagaricus leucothites has a white cap, gills and stem and does not blush red when bruised. These mushrooms are generally considered edible; however. 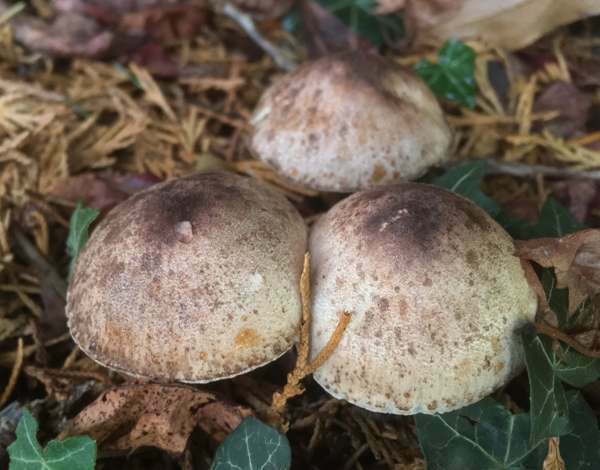 there is a risk of confusion with one of the toxic white-gilled Lepiota species - for example the Stinking Dapperling Lepiota cristata - that can occur in the same kinds of habitat. Funga Nordica: 2nd edition 2012. Edited by Knudsen, H. & Vesterholt, J. ISBN 9788798396130. Breitenbach, J & Kränzlin, F (1995). Fungi of Switzerland. Volume 4: Agarics (Part 2). Entolomataceae, Pluteaceae, Amanitaceae, Agaricaceae, Coprinaceae, Strophariaceae. Verlag Mykologia: Luzern, Switzerland. 368 p.
Noordeloos, M E, Kuyper, T W & Vellinga, E C (2001). Flora Agaricina Neerlandica—Critical monographs on the families of agarics and boleti occurring in the Netherlands. Volume 5. Agaricaceae. A. A. Balkema: Lisse, Netherlands. 169 p.